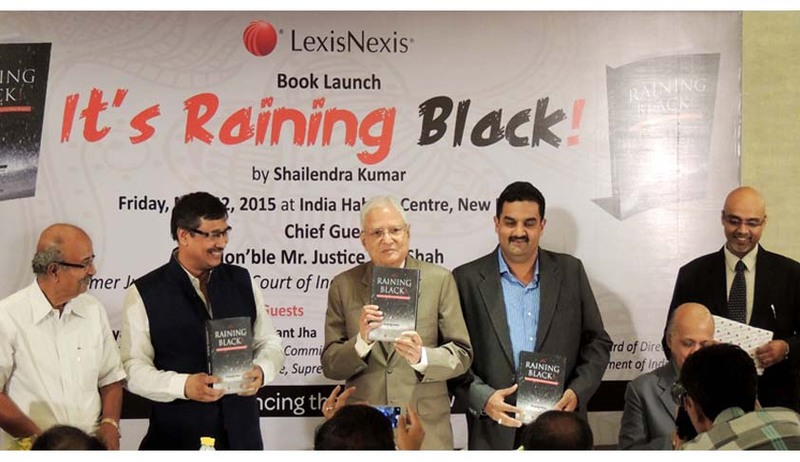 LexisNexis India has launched a new book titled “It’s Raining Black! Chronicles of Black Money, Tax Havens & Policy Response”. The book has been authored by Mr. Shailendra Kumar, Founder Editor and CEO, taxindiaonline.com (TIOL), a globally reputed taxation and trade portal. The Book-launch event was held at India Habitat Centre, New Delhi and saw the presence of several eminent jurists, bureaucrats, administrators, and many other distinguished guests and professionals from the fields of Law, Tax and Media. Chief Guest Mr. Justice MB Shah, former Judge Supreme Court of India and Chairman SIT on Black Money spoke about the strong linkage between corruption and black money and the need for enactment and enforcement of law to curb the same. Guest of Honor Dr. Justice Arijit Pasayat, former Judge, Supreme Court of India and Vice Chairman SIT on black money also mentioned about the need to have zero tolerance against corruption and to work towards getting the legitimate dues for the betterment of society. The book is spread over eight chapters dividing the analysis into two broad aspects, first, the domestic perspective and secondly, the international arena. The underlying theme of the book is that unless domestic generation of black money is curbed, our gallant efforts to retrieve wealth from tax havens would not meet with much success. It throws a different light on the Black Money (Undisclosed Foreign Income and Assets) and Imposition of Tax Bill, 2015 and raises significant questions for severe consideration by the Government.